Last June, I saw my first rope drop ceremony. Yup. 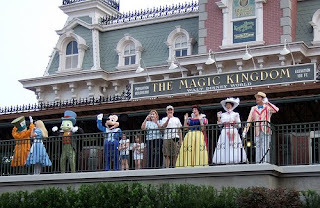 Over 20 years past my first visit, I discovered the rope drop ceremony at the Magic Kingdom. Like many, I was awed. We recorded it, and I watched it at home, looked up others on YouTube, and couldn't wait to get back to the Magic Kingdom 45 minutes prior to opening to watch the show again. Our first possible rope drop morning, post half-marathon, we headed to pick up my friend Ruth at the Caribbean Beach Resort. She had to check out and we knew we would be cutting it close, but we headed to EPCOT, knowing we would en our day there and wanted to save a stop parking there. We ran straight up the ramp to get on the monorail to TTC then transfer over to the Magic Kingdom. Maybe it was the additional stop, but we headed into the park shortly after the gates opened, missing the ceremony completely. Slightly disappointed, I was convinced we would easily make the ceremony the following day, so we headed to Fantasyland to start our day. The second of our 3 park mornings, we headed to Disney's Hollywood Studios. We caught the morning show - surprisingly, because the previous June, there had been no morning show. Similar to one of the street shows, the DHS rope drop was a nice welcome, but I still was determined to catch the Magic Kingdom rope drop. Our 3rd and final morning, we arrived at the TTC parking lot with plenty of time. We knew the two options - ferry boat or monorail. The ferries have always been the other option - when the monorails were over crowded, or at the end of the night with no rush. Maybe it took the same amount of time, but it always seemed to be more leisurely - waiting for more passengers, and then a slow ride across the lake. So, we headed straight to the monorail headed to the magic kingdom. The doors closed, and we had no doubts that we would soon be at the Magic Kingdom for rope drop. Until the doors reopened. The monorail wasn't working and we all had to disembark and change trains. As we finally reached the Magic Kingdom, the ferry was long since gone from dropping off it's passengers, headed back towards the TTC. The train at the Main Street U.S.A. train station was pulling away from the station- the rope drop had been dropped. We had missed the show again. Disappointed, we entered the Magic Kingdom for our last park day. Luckily, the park was filled with magic and uplifting spirit again. Hopefully next January, for our WDW Half Marathon 2012 trip, we'll actually successfully make it to the Magic Kingdom on time for the show. Maybe, we'll take the ferry instead. I'm a big fan of the ferry anyway. It has a larger capacity, so even though it takes a few minutes longer, if there are lines for both, your best bet is often the ferry. Plus, you get that spectacular view of the castle! Your blog is looking good! Aww! I'm sorry you didn't make it like you had planned, but there's always next time... which will be here before you know it! Good luck! No trip is complete without seeing the rope drop show at MK! At least one morning we leave the room by 7:45 ish and usually get to Mk by 8:15. Plenty of time!! :) Good luck next time!! !